This may seem rather random, but it has taunted me year after year… what to make with leftover creamed spinach from holiday meals? I make this old-fashioned, heavy, deliciously decadent creamed spinach for every holiday meal on demand of my family (get the recipe here: Creamed Spinach with Bacon and Onions), and then freeze the leftovers. If you did the same, you might be excited to try this little leftover creamed spinach recipe creation I invented, it was a total hit here. You may not believe what I am about to tell you, but I swear it is true: My two year old ate spinach! I speak the truth! Worth a shot, right? And please, share with us in the comments, what do you make with leftover creamed spinach? You could win some pom pom trim! Defrost your creamed spinach, or go ahead and make some with our recipe: Creamed Spinach with Bacon and Onions. In a bowl, mix the spinach with two eggs and add some cheese, I used gruyere but you pick whatcha like. Remove to a floured surface (I have to plug my parmesan-shaker flour dispenser here) and gather into a ball. Knead 10-12 times, then set in a bowl and cover with a damp towel. Let sit for 15 minutes. I use it as Spinach Dip the next day with chips! Genius! Now we can have quick meal in the freezer without everyone feeling like death after eating real hot pockets! 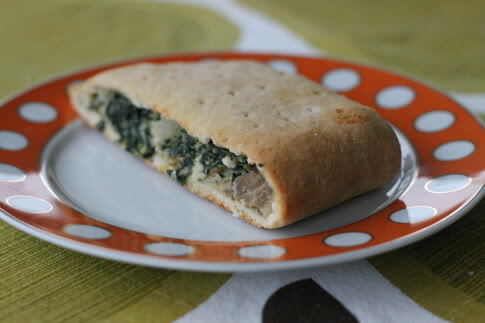 I used the left over creamed spinach and buy philo dough and make a sort of pastry with the creamed spinach as the filling. OR I get the 99cent french baguet and slice them and top it with left over creamed spinach and top it with mozarella cheese and stick it in the over… It's yummy goodness! Especially when paired with fettuccine alfredo or a nice cup of clam chowder! Oh, I need to try a modified version of this. Yum. I've always used left over cooked spinach in an omelet. I imagine that could work for creamed spinach too. Keep it up, you have a loyal reader in me!